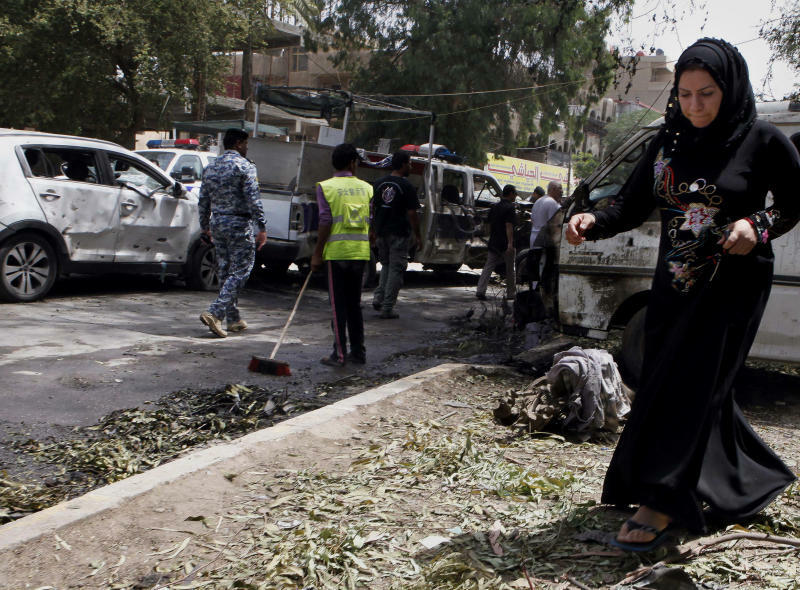 BAGHDAD (AP) — A series of bombs in Iraq, including one targeting a provincial governor, killed at least 30 people Thursday and wounded dozens as a tireless wave of violence further rattled the country. Iraq is experiencing its most relentless round of bloodshed since the 2011 U.S. military withdrawal, deepening fears that the country is heading back toward the widespread sectarian fighting that pushed it to the brink of civil war in the years after the invasion. More than 500 people have been killed in May, with attacks escalating in the last two weeks. The month before was Iraq's deadliest since June 2008, according to a United Nations tally that put April's death toll at more than 700. Prime Minister Nouri al-Maliki's office said he spent three hours inspecting checkpoints throughout the capital late the previous night, underscoring growing concerns about the security forces' ability to stem the violence. Authorities in Baghdad also announced a ban in effect from early Friday on cars bearing temporary black license plates, which are common in post-war Iraq, where for years it was difficult to obtain new ones. The plates are typically on older model vehicles and are more difficult to trace, and authorities say they are frequently used in car bombings. 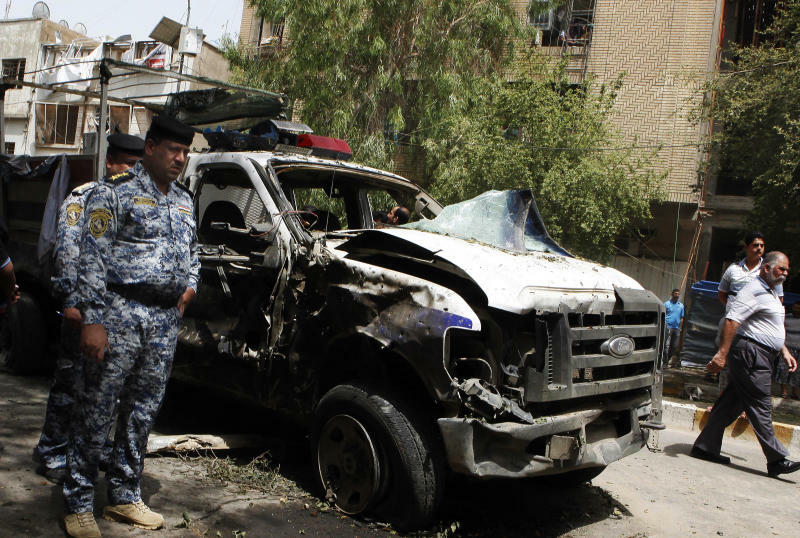 Most of Thursday's blasts went off in Baghdad. Car bombs killed four in the northeastern Shiite neighborhood of Binouq, and three died in a bombing at a market selling spare car parts in central Baghdad, according to police. In Baghdad's eastern Shiite Ur neighborhood, a parked car bomb went off next to an army patrol, killing four and wounding 17, police said. Police officials also said that a roadside bomb exploded near a police patrol in the largely Shiite central commercial district of Karradah, killing three people there. The Karradah blast shattered glass and twisted metal signs on several storefronts, and left the stricken police unit's modified Ford pickup truck charred and mangled. "What have these innocent people done to deserve this?" asked witness Sinan Ali. "So many people were hurt. Who is responsible?" 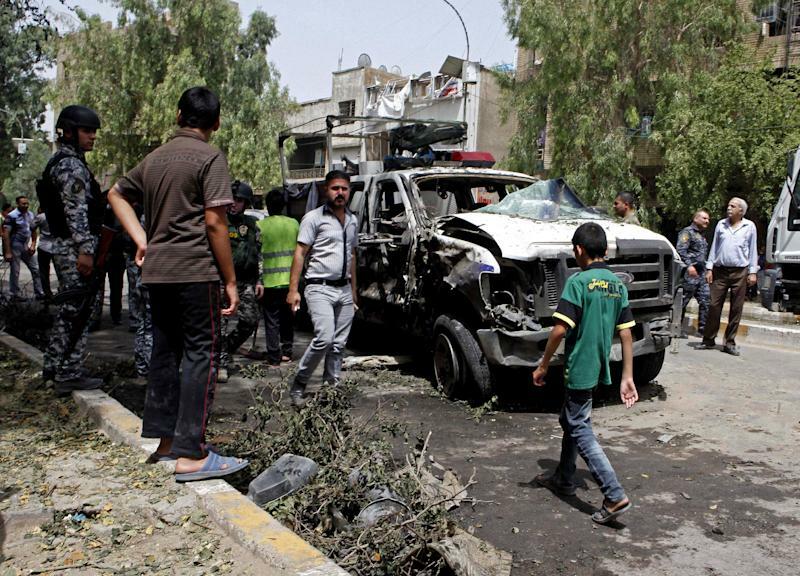 In Baghdad's northern Shiite neighborhood of Shaab, a car bomb exploded in a commercial area, killing six civilians and wounding 17 others. In the largely Sunni neighborhood of Azamiyah in the capital's north, a car bomb struck near a military convoy, killing three people, including two soldiers, according to police. Another 14 people were wounded in that attack. Another police patrol was struck in the southern neighborhood of Saydiyah, injuring six. In Anbar province, the provincial governor escaped an assassination attempt when a suicide bomber rammed his explosive-laden car into his convoy, his deputy Dhari Akan said. The governor escaped unharmed, but four of his guards were wounded, Arkan said. Anbar is a vast Sunni-dominated province west of Baghdad that has been the center for months of protests against the Shiite-led government. In the northern city of Mosul, two police officers said a suicide bomber killed three when he blew himself up on a federal police checkpoint. Mosul is a former insurgent stronghold, located about 360 kilometers (225 miles) northwest of Baghdad. And to the west of Mosul, a suicide attacker drove his explosives-packed car into a security checkpoint, killing two members of the security forces and two civilians, a police officer and a doctor said. Eight other people were wounded in the attacks in the town of Tal Afar, they added. All officials spoke on condition of anonymity because they weren't authorized to talk to the media. The United Nations envoy to Iraq, Martin Kobler, urged Iraqi leaders to do more to urgently "pull the country out of this mayhem." "Systemic violence is ready to explode at any moment," he said in a statement. There was no immediate claim of responsibility for the attacks but blame is likely to fall on al-Qaida's Iraq arm, which frequently carries out bombing attacks against civilians and security forces in an effort to undermine faith in the Shiite-led government. Other militant groups have also grown more active in recent months, including the Army of the Men of the Naqshabandi Order, which has ties to members of Saddam Hussein's now-outlawed Baath party. The attacks came hours after bomb blasts tore through two Baghdad neighborhoods Wednesday evening. At least 30 people were killed, including several members of a wedding party in the mixed Sunni-Shiite Jihad neighborhood. Many of Jihad's Sunni residents earlier this year received threatening leaflets from a Shiite militant group, the Mukhtar Army, warning them to leave. Associated Press writers Adam Schreck and Sinan Salaheddin contributed to this story.